Juicing has become all the rage recently, and no wonder why – juicing is a way to get your 5 a day all at once. Juicing has proven to overall improve your health, give you more energy and improve the quality of your life. Although not every juice is made equally, for someone who is serious about juicing and improving health, you may want to know that there is a real difference in slow cold pressed and regular juicers. A regular juicer usually has blades that work at extremely fast speeds. Although it sounds as an advantage, this causes the blades to heat up and essentially cook everything that passes through them killing off a great majority of the vitamins, minerals and enzymes that you actually want out of juice. A low speed juicer or a cold press juicer retains more nutrients and enzymes resulting in better tasting juice that is healthier for you. As far as the market for a cold press juicer goes, the Kuvings whole slow cold press juicers are by far the best low speed juicer available on the market today. The difference in quality does matter. Higher quality means healthier, tastier and longer lasting juice. The juice from a cold press juice is extracted gently to make sure that all the minerals and vitamins stay alive. Pressing juice in this particular way helps your juice stay fresher for longer. A regular juicer tends to let a lot of oxygen into your juice, that’s why you will usually see separation form. With a Kuvings whole slow cold press juicer there is less oxygen which ensures your juice stays fresh; you can even store your juice in a resealable glass bottle for up to 72 hours. 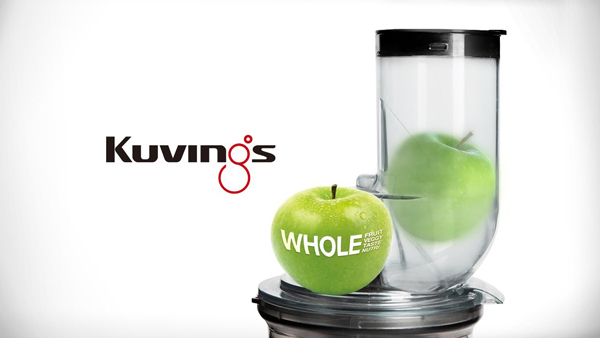 The Kuvings whole slow cold press juicer is the quietest slow juicer available on the market. So if you’re someone who likes to juice at night, or someone who makes juice in the morning before anyone is up, you don’t have to worry about waking anyone up; or if you’re just someone who would enjoy the luxury of owning a juicer that isn’t noisy, this is the juicer for you. Whether you’re juicing hard vegetables like carrots or soft vegetables like spinach, the noise level is the same, and the quality of juice will not waver. Cold press juice has once again proven its superiority over eating raw fruits and vegetables or consuming them in a form of smoothies. The digestion absorption rate and the digestion absorption time is much quicker when you consume cold pressed juice than when eating healthy produce the traditional way. While you will still absorb vitamins and minerals from smoothies or whole fruits and vegetables make no mistake that the difference is still a drastic one. It’s still healthy to consume them the traditional way but the absorption rate for cold pressed juice is 65% and you will absorb all of that in a matter of 10 to 15 minutes. For smoothies the rate for absorbing the nutrients is 17% and it will take your body up to 2-3 hours, which is the same amount of time it will take your body to absorb all the nutrients if fruit and vegetables are eaten fresh and in original form. Juice made with a traditional juicer tends to go bad quicker, the oxygen that gets mixed in the process creates separation within the juice, hence it should be drank almost immediately, otherwise your juice can become contaminated quickly. Most people struggle to consume their daily intake of fruit and vegetables so juicing is a great option to meet all your dietary needs. If you’re on the market for a new juicer than I suggest buying the Kuvings whole slow cold press juicer, your juice will be of the highest quality with all the added health benefits. Your body and mind will thank you for it.